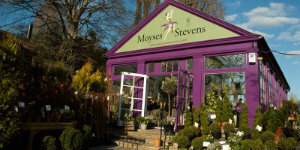 Since 1876 Moyses Stevens has been known for the artistry and quality of its floristry. The Moyses Stevens story is steeped in history - not only are we famed for introducing the hand tied bouquet, our impressive designs have won us two royal warrants and put British floristry on the map. Over the years we have held the Royal warrant for Her Late Majesty Queen Elizabeth The Queen Mother and we currently hold the highly prized Royal Warrant by the appointment of HRH The Prince of Wales. 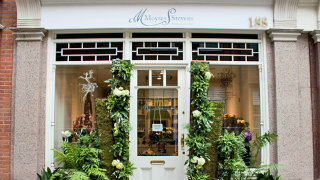 Moyses Stevens has had an incredible journey since its first shop opened in London, Victoria providing flowers for the London gentry. In the 1920s our shop in Berkeley Square was described as a ‘veritable Chelsea Flower Show every day of the year’ and over the years the famous and exemplary ‘Moyses standard’ has been firmly set and maintained. Today we have five equally beautiful and inspirational shops spread throughout the capital including a concession in Harrods department store and a flourishing floristry studio. The standard of our floristry is well known. We only employ experienced and well taught florists who have been fully trained and who are well versed in all aspects of floristry. Our bouquets leave our premises in beautiful Moyses hand-tied flower bags that have our logo, as well as the Royal Warrant, clearly but elegantly displayed on them. Our bouquets are wrapped skilfully in clear cellophane and smooth white tissue paper and are tied with the famous ‘Moyses ribbon’ that bears our name as well as our company’s colours. 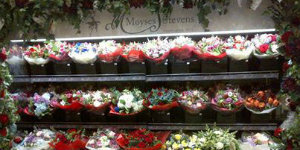 Moyses Stevens delivers on the same day to any area of London whenever an order is received by 3pm. We have a team of well trained and experienced drivers, some of whom are former florists and all of which are trained in handling flowers, ensuring that our flowers reach our recipients in just as good a condition as when they left our studio. Our shops receive deliveries directly from Holland and various British growers Monday to Saturday; thereby cutting out any middlemen and ensuring everlasting freshness and great stock quantity throughout the group. We are well famed for being able to handle last minute requests no matter how large and extravagant they may be. Within our group we have a whole sale sundries department, which ensures more middlemen are cut out and the cost saving is passed on to our customers. Moyses Stevens only deals with ‘A-type’ class of flowers.